We love: That this is an Australian made product. Chromacryl white acrylic gesso is a multi-surface primer that will allow you to prepare any surface for either acrylic or oil paints and mixed media. Chromacryl white acrylic gesso will provide any surface with an excellent coat of primer that is both smooth and even to allow for the proper preparation for your mediums. Preparing your surface with an acrylic gesso will give you a nice clean base to work with and it will also create a barrier between your surface and chosen medium/s. This barrier allows your medium to sit on top of your surface and not be absorbed into it. This is great for two reasons. One: if you are using expensive products, you won’t need to use as much because it isn’t being soaked into the surface. Two: Your colours will appear a lot brighter especially if you are working with a white acrylic gesso background. 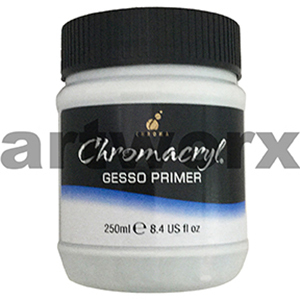 Chromacryl acrylic gesso is a smooth consistency that will not provide you with a tooth; it will simply give you a nice opaque white surface to work on. This product is made with beginners and students in mind; it is an economical white acrylic gesso that is available in 250ml, 500ml and one liter pots. Tip: If you are buying cheap canvases and happen to be using artist quality mediums then give your canvas another coat of gesso so that your not wasting your art supplies.